What did you want to be when you grew up? For some, easy question. For others, it could be very late in the high school, even college experience before they make the decision. Would your choice be different if you had a chance to take tours of certain companies or businesses? 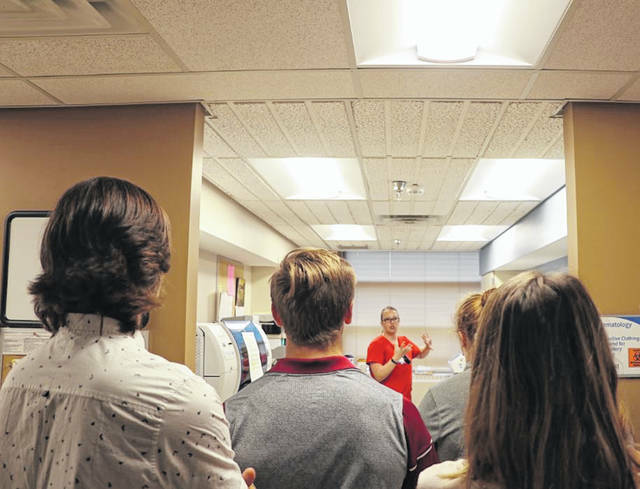 On Sept. 20, more than a dozen students from the Buckeye Valley Local School District toured OhioHealth Grady Memorial Hospital. From patient registration, labs, pharmacy, imaging and more, these students had the chance to be face to face with those who work hard, take care of patients, and contribute to the community many of them live in. With this tour, Buckeye Valley High School and OhioHealth Grady Memorial Hospital are hoping to bring their worlds together, potentially finding the perfect fit for a teen’s career. For many of these students, they are still trying to forge a path that will lead them to a career they love. Senior Hanna Rader says a tour like this really opened her eyes. “Not sure what I want to do yet, but to have something like this to help me, and guide me, I hope it gives me a push,” Rader said. That’s exactly what the goal of a tour like this is. To allow these students to consider something they may have not even known existed. Lisa-Marie Reinhart is with the Delaware Area Career Center and says that these types of experiences can’t happen without a good partner like OhioHealth. While the students get plenty out of a tour like this, Sanford said don’t think for a second that the teams at the hospital don’t enjoy it, and even look forward to paying it forward. “A tour like this allows our associates to share their passion for the areas of the hospital they work in, and I know they are proud to have the opportunity to show some of the departments that might be considered a little more behind the scenes,” Sanford said. “I think it’s important for workforce development, always looking for that talent acquisition and that pipeline of employees,” Reinhart said. In health care, there are so many jobs beyond the doctors, nurses and physician assistants. While some of these high school students might go in that direction, a tour like this could send them in a brand new direction. Rader says having these opportunities not only says a lot about her school district, but the Delaware County business community. “It shows we are not just sitting in classrooms, we are going out and being shown this is an opportunity for you, and we will help you,” Rader said.